Small Circle Jujitsu™ is based on the 2,000 year old classical jujitsu and was founded in approximately 1944 by Professor Wally Jay. Professor Jay's years of experience in classical jujitsu, judo, boxing, weightlifting, wrestling, aikido, kung fu, and other other martial arts led him to develop Small Circle Theory. His goal was to combine the best of everything he learned from the various disciplines. The small circle theory is a proven scientific method and has been accepted by the martial arts world as an acclaimed and accredited system. ​​The Japanese combat techniques of Jujutsu (also commonly known as Jujitsu and other spellings) date back at least 2,000 years. The exact origins of jujutsu are unclear, as most of its history was only passed on in the oral tradition. The few early written references show that its origins date back to mythology. Jujutsu was formalized and most popular during the Edo period of Japan. This was the era of the samurai. Jujutsu was the samurai’s main set of combat techniques, after the sword that is. There have been many, many styles (or ryu) of Jujutsu throughout the history of Japan and more recently the rest of the world. The origins of Small Circle Jujitsu™ are based on the 2,000 year old classical jujitsu, but the revelation of the small circle emphasis dates back to approximately 1944. The founder, Professor Wally Jay studied a style known as Kodenkan Jujitsu from Professor Henry S. Okazaki in Hawaii. Professor Okazaki had studied classical jujutsu styles of yoshin, kosagabe and iwaga, as well as studying Okinawan karate, Filipino knife fighting, Hawaiian lua, the art of throwing a Spanish dirk, boxing, wrestling and kung fu. Professor Jay had studied boxing, weightlifting, judo and jujitsu from various instructors before 1944, when he received his black belt in Kodenkan Danzan Ryu Jujitsu from Okazaki. Professor Jay became aware of the fact that there was something missing with Jujitsu, the way he learned it. The knowledge he gained from the other disciplines and Okazaki’s own multi-disciplinary background gave him the perspective to see how classical jujitsu could be improved. It was his two years of judo study under Ken Kawachi that gave him the key to small circle. Sensei Kawachi stressed the use of the wrist action to gain superior leverage. Wrist action is the key to Small Circle Jujitsu. Over the years he made radical changes in the jujitsu techniques he acquired, believing that this was what his teacher, Professor Okazaki, would have wanted. A point in fact is that Professor Okazaki himself was somewhat of a rebel, as he broke away from tradition on several occasions. He taught non-Japanese as well as developing his own style of jujitsu, called Kodenkan Jujitsu. Professor Jay’s years of experience in classical jujitsu, judo, boxing, weightlifting, wrestling, aikido, kung fu, other martial arts training, and many periods of trial and error, led him to develop his theory known as Small Circle Theory. His goal was to refine and improve upon the techniques by combining the best of everything he learned in different disciplines. The small circle theory is a proven scientific method that rapidly became accepted by the martial arts world as an acclaimed and accredited system. The small circle theory is not only applicable to jujitsu, but it blends in beautifully with other styles of martial arts. In fact, Professor applied the small circle theory to his judo teaching and led his team to become a winning team. 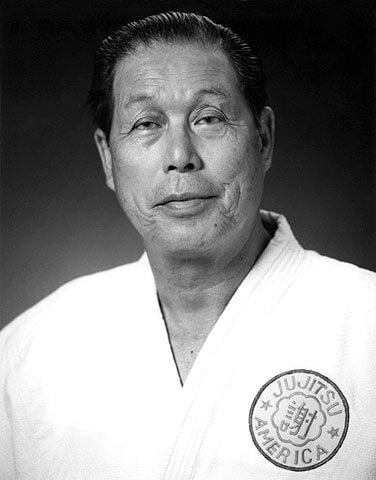 ​In 1960 he was voted Northern California Judo Coach of the Year by Hokka Judo Yudanshakai. Throughout the 60’s and 70’s he produced national champions and team winners in Hawaii, Canada, USA, and Mexico. In 1978 Professor Jay, Willy Cahill, John Chow-Hoon and Carl Beaver created Jujitsu America. They seceded from the Hawaiian based American Jujitsu Institute (which was the Kodenkan organization) because they had conflicting ideologies and methodologies. This group represented the mainland jujjitsuka who decided to break away from the old organization. The Hawaiian leaders wished to perpetuate the traditions of the Kodenkan system while the state-siders, being modernists, wanted to update and improve their fighting skills to reflect certain modern realities. This Small Circle Theory improved and culminated until 1987, when it officially became recognized as a complete jujitsu style on its own, now known as Small Circle Jujitsu™. Many had recognized the small circle system as being a separate style for many years, but after an article in Black Belt magazine, it was official. Professor Jay’s small circle jujitsu techniques are smooth and functional because of his creation of the flow, which interchangeable techniques are used to counterattack the moves of the attacker. Small Circle Jujitsu™ evolved from combining many sources and elements, and continues to evolve as Professor Jay and others enhance the style with their knowledge.